Tripadvisor ranking 2014 - no 1 of 61 Specialty Lodging in Brasov and Certificate of Excellence in every year. 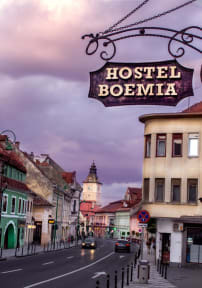 Boemia is a small hostel with a friendly air where you can meet nice peoples and we offer you a different way of staying in Brasov. 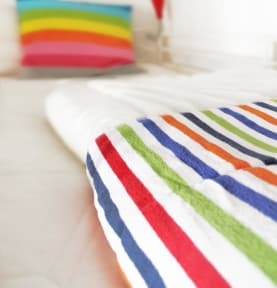 We're open for all travellers who search for style, quality and a classy atmosphere but at same time want to feel at home. We are situated in the hart of historical center of Brasov. Around us you will find pedestrian streets full of attractions, restaurants, cafes, shops, tourism info spots, a beautiful panoramic view of Tampa situated at 900m above the sea level, the Black Church is at 50 m and the square at 100 m by us. FREE BREAKFAST, Wi-Fi, FREE Coffee and Tea all day long; personal lockers in the rooms; reading lights; FREE maps; touristic info and guides. The breakfast is a buffet and we have: coffee, tea, milk, cereal, salami, traditional bread, margarine, jam, honey and depending of the season, fruits. Do you want to go on the mountains? We love the nature, at us you can find maps, information and tips about mountain pats for beginners and advanced, day trips or more. Do you want to go at Bran Castle (Dracula Castle) Ples Palace, Rasnov Fortress, bear sanctuary or other places? At us you can find information how to go there and also we have organized trips. Отличный хостел в самом центре, остался очень доволен, всем рекомендую.